With 600+ events and over 7'000 participants across the globe we are the leaders for providing know how in online reputation. Online feedback is one of the main business challenges for hoteliers at the moment. 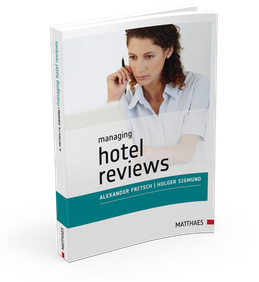 Book authors and tourism experts Alexander Fritsch & Holger Sigmund will give first-hand-information for managing hotel reviews and working with a hotel’s online reputation. This 4-hour-event is exclusively designed for hospitality professionals. If you like to be kept updated regarding new training events, please write us an e-mail. The training will be in English. Seating is limited and prior online registration is required. The fee for participation is EUR 120, payable in cash on location (you'll receive an invoice). With your registration, you are accepting our » terms. are renowned experts for online tourism. They have 20 years of experience as trainers and university lecturers. © 2016 Tourismuspartner. All Rights Reserved.